This obviously incorrect reading of the nature and goals of the so-called “International Communist Conspiracy” provided Hollywood, during the years of the House Un-American Activities Committee and afterward, with an easy way both to ingratiate itself with suspicious governmental and religious authorities, and to justify and protect from censorship a steady stream of violent, sensationalistic B-films. The tradition of overt political comment in science fiction film, rooted firmly in Fritz Lang’s Metropolis and William Cameron Menzies’s 1936 British film Things to Come, found its American precedent in The Day the Earth Stood Still. But though the latter film paved the way for political attitudinizing in fantasy-film, it looked in quite a different political direction than did its progeny. Indeed, with its pacifist theme, it remains the only science fiction film of the Fifties with an identifiably leftist point of view. The waves of alien invaders that followed were even more clearly socialist-Communist than was Klaatu; but Klaatu was the hero of The Day the Earth Stood Still, while the later invaders were clear-cut villains. The Martians of War of the Worlds are not easily categorized as to political viewpoint, but they are clearly expansionist—which was synonymous with Communist to Americans in 1953. And, in Barre Lyndon’s adaptation, the film was imbued with a religious theme not present in H.G. Wells’s novel, identifying the invading aliens with atheism—again, something widely associated with Communism. One of the earliest monster movies with an expressly rightist viewpoint is Killers from Space, a low-budget quickie that rode hard on the heels of the successful Them! in late 1954. Directed by W. Lee Wilder, the film employs invaders from another planet as a metaphor for a cell of subversive agents promulgating espionage and sabotage. Peter Graves portrays a nuclear physicist, Dr. Douglas P. Martin, who is captured by monklike humanoids with huge, staring eyes. The aliens hypnotize him into amnesia and release him with the mission of obtaining for them information on atomic tests, so this knowledge can be used in their war against humanity. The heritage of the Korean War is clear in the metaphors of the film, whose hero’s basic actions parallel those of the brainwashed protagonist of The Manchurian Candidate (John Frankenheimer, 1962). Dr. Martin is clearly a valiant American hero who has been cruelly altered by subversive elements and turned into a traitorous spy. The expression of subversion through the alteration or replacement of human beings with alien mentalities was not always so obvious, however. One of the most celebrated—and chilling—science fiction films of the decade, perhaps of all time, deals with a kind of displacement so subtle it is scarcely noticeable. This is Donald Siegel’s minor masterpiece Invasion of the Body Snatchers (1956), one of the formative science fiction films of the period, and a key exponent of the infiltration-paranoia that haunts so many contemporaneous films. In Daniel Mainwaring’s screenplay, based on Jack Finney’s Colliers Magazine serial “The Body Snatchers,” the protagonist is a country doctor named Miles Bennell (played by Kevin McCarthy). The opening scene discovers him, in a state of violent paranoia, in a hospital where he has been brought after being hauled off a highway in hysterics. A psychiatrist, Dr. Hill (Whit Bissell), is confused as to what to make of Bennell’s doomsday babblings, but agrees to listen to his remarkable story. This sets the frame for the film proper, an extensive flashback that begins about a week earlier. But that evening, as Dr. Bennell and Becky prepare to dine in a deserted restaurant, a writer, Jack Belicec (King Donovan), calls them to his home to reveal an extraordinary creature he has discovered in his house. Stretched out on the pool table is a body, clearly human but strangely “blank,” devoid of the features that distinguish a human being. Going on the assumption that the thing is a corpse, Dr. Bennell soon discovers to his horror that the creature has never been alive. He is unable to suggest what it might be; but he, Becky, Jack, and Teddy, Jack’s wife (Carolyn Jones), all agree with a chill that the thing’s configurations strangely resemble those of Jack himself. Dr. Bennell cannot help but associate the strange thing with the wave of complaints about mysterious changes in people. Later, when the “blank” begins to come to life, taking on Jack’s features, the Belicecs flee to Bennell’s house to tell their story. Acting on an intuition, Bennell races to Becky’s house and breaks into her cellar, where he discovers another “blank” creature in a trunk. Again it is a featureless body, but unmistakably a crude image of Becky. Unnerved, the doctor determines to get her away from the house, and carries her out in his arms, in a dramatic reversal of the classic “Beauty and the Beast” abduction scene. The pieces of the puzzle begin to fall together when Miles and Jack discover some strange, outsized seed pods in Miles’s greenhouse. As they watch, the pods split open and hatch more of the “blank” humanoid figures. The things are a kind of soma—without identity, features, fingerprints, or other identifying characteristics—with the ability to complete their formation by tapping the subconscious minds of sleeping human beings. As the victim sleeps, the “blank” draws off his genetic and psychological identity, assimilating them unto itself. At this point the soma is an exact physical and mental duplicate of the victim. It is then a simple matter for the replacement to dispose of the victim’s body. In this way, “body snatchers” have already replaced a vast majority of the population of Santa Mira with duplicates that are exact copies, but lack emotion, personality and individuality. This lack briefly causes the persons closest to the body snatcher to claim that their relative or friend “is not himself,” “has changed.” But soon the complainers are themselves replaced by body snatchers, and the complaint is withdrawn. Using pitchforks, Miles destroys the “blanks” in the greenhouse and determines to seek out and destroy the source of the evil. But already it has become too big for him. The salient feature of the body snatchers is regimented, unthinking compulsion to subvert and proselytize, and the number of victims grows geometrically. Jack Belicec and his wife, sent out by Miles to search for other pods, become themselves body snatchers. Dr. Kaufman, Jack Belicec, and the town’s sheriff (Ralph Dumke) seem to become the “head body snatchers” and take upon themselves the project of converting Dr. Bennell and Becky, who by now appear to be the only holdouts left in Santa Mira. They are most persuasive and insistent missionaries, pointing out patiently to Dr. Bennell that a world of body snatchers would be a Utopia, the answer to centuries of human dreams. Dr. Bennell rejects a Utopia that demands the sacrifice of human individuality, passion, and freedom. The body snatchers remain complacent, knowing that he will have to sleep sooner or later, and the replacement can then become complete. While they wait, Kaufman explains that the seed pods fell from space and landed in a nearby farmer’s field, from whence the process of duplication began. Already pods are being unloaded from trucks in the center of town, which has become the headquarters of a massive campaign of subversion aimed at the entire country—and probably the world. Citizens of Santa Mira converge on the trucks, take their allotted pods, and fan out to—quite literally—convert their friends in neighboring towns. Trapped in Bennell’s office by Kaufman, Jack, and the sheriff , Miles and Becky divert the body snatchers’ attention momentarily, fill hypodermic syringes with a strong sedative drug, and inject them into their backs, knocking them out. They walk out into the town square, pretending briefly to be themselves body snatchers, and escape into the neighboring hills. Unable to sleep for fear of the replacements, they run until exhausted, hoping to reach another area of civilization, to tell their story and obtain help. They seek shelter in an abandoned mine tunnel. Hearing music, and knowing the body snatchers to be devoid of the kind of sensitivity that inspires song, Dr. Bennell leaves Becky in the tunnel and goes to seek out the possible source of aid. To his bitter disappointment, it turns out to be a radio, playing while body snatchers harvest more pods (perhaps a wry comment on Muzak, the pabulum of the workaday conformist). Returning to the mine, Bennell is in for another rude shock. Looking at him with emotionless eyes, Becky explains, “I fell asleep, Miles, and it happened.” She immediately begins to persuade him that being duplicated is not so bad after all. He flees from her into the night, pursued at every turn by body snatchers. He finds himself at last at the edge of a bustling freeway. Trucks roar by, bearing pods to other areas of the country. The people driving past in their cars, oblivious to the subversive danger, ignore his hysterical cries of “You’re in danger! They’re after all of us! They’re here already!” Straight into the camera he cries, “You’re next!” The flashback ends as his echoing warnings and blurring image recede into the rush of traffic. In light of this, the whole tone of the film is changed by the occurrence of the prologue, for now we are constantly aware that this is a flashback, one man’s story, and may very well be hallucinatory or fraudulent. As convincing as the atmosphere of the film proper is, there remains in the audience a trace of skepticism, of disbelief. Thus the whole response of the viewer to the film will hinge on the epilogue. As we go into the epilogue, we are already aware, from our familiarity with filmic and literary convention, that one of three things must occur. The first possibility is that, à la The Cabinet of Dr. Caligari, the entire story will turn out to have been the distorted construct of a disordered mind. This, in fact, is the conclusion the prologue seems to point to. The second alternative, also suggested by Caligari, is that the story will be proven true when the psychiatrist to whom Bennell has told it turns out also to be a body snatcher. This might, in fact, have been the best epilogue for Siegel to use in order to retain his doom-saying point. But undoubtedly it would not have set with the studio any better than the conclusion of the film proper. The third possibility is what actually occurs: and, all things considered, it is probably the best option available to Siegel at the time. The psychiatrist, Dr. Hill, is inclined—as who would not be?—to view Dr. Bennell’s story as paranoiac ravings; but at the last moment the truth of the story is confirmed, quite by accident, by an uninvolved outside party: an ambulance attendant reporting on an injury caused by a collision with a truck filled with giant seed pods. Hill now has no choice but to believe Bennell’s story, and the film ends, not as before on a note of doom, but with the optimistic suggestion that it is not too late for action to be taken and for humankind to destroy the invaders. Because it is so abrupt, and compares so unsatisfactorily with the unsettling quality of all that has gone before, the epilogue of Invasion of the Body Snatchers fails to convince, in the same way as did the ending to The Cabinet of Dr. Caligari. In both cases, the epilogues were not part of the original intent, but were concessions to studio heads. And, in each case, the epilogue has been handled so deftly that the filmmaker’s original vision remains with the viewer and wins the day. For the ending to Invasion of the Body Snatchers does not really provide enough evidence to convince us—or the psychiatrist—that Dr. Bennell is sane, any more than the ending to Caligari fully convinces us that Francis is mad. The filmmaking that has gone before is so powerful that it casts doubts exactly where the director wanted them, on the credibility of the epilogue. Yet in a sense the epilogue is a greater weakness in Invasion of the Body Snatchers than in Caligari. Not only does it corrupt Siegel’s despairing vision with a false note of optimism; it also does not fully offset the suggestion of subjectivity created by the prologue. Since the film proper has become a flashback, we have only Dr. Bennell’s word for the truth of any of it. And the ambulance attendant’s confirmation of the existence of giant seed pods in no way assures us that those pods are really instruments of alien infiltration, or that anything Dr. Bennell has related is really true, except his observation of those truckloads of pods shortly before being picked up on the freeway. The safest solution, then, is that to be fair to the meaning and intent of Invasion of the Body Snatchers, one must disregard the prologue and epilogue, and allow the film to end with Dr. Bennell’s pointing wildly at the audience and screaming, “You’re next!” Viewed in this context, the film is an unbearably gripping prophecy of doom—all the more discomforting for its ingenious playing upon some key psychological vulnerabilities of the viewer. A number of childhood fantasies are used in developing the film’s power to have an intimate and frightening effect on its viewers. The seed pods, for example, provide a grim parody of many parents’ response to the juvenile’s question, “Where did I come from?” The child’s doubt of the true mother is also a universal experience of the infantile psyche, which remains present in the adult subconscious. But the key psychological attitude brought into play is, of course, paranoia, in a vast array of its various manifestations, from the childish “No one will listen to me” all the way up to the suggested conviction, “I am the only one who is sane.” The tendency towards paranoia is present to some degree in all of us, stemming, no doubt, from the remembered experience of infancy and childhood, and forced exclusion from the world of grownups. Dr. Miles Bennell’s very real experience parallels not only the imagined experiences of paranoid personalities but also the isolation of the child in the adult’s world, a sense of being simultaneously alienated, yet controlled beyond one’s power to resist. This is specifically expressed in one of the film’s most chilling scenes, in which—glimpsed through a window—the Sheriff and Bennell’s nurse Sally (Jean Willes) decide the time has come to place one of the pods in the next room with her crying baby: “Then there will be no more tears,” says the nurse. 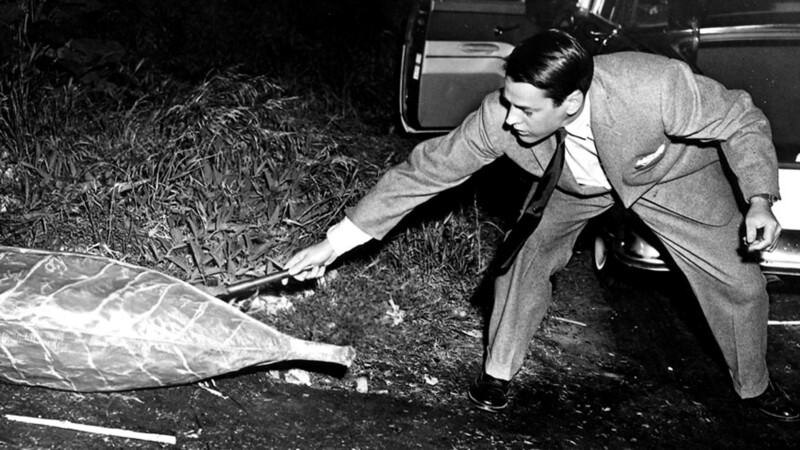 Particularly telling is the film’s use of sleep as the state during which the body snatchers do their work on the victim. Dr. Bennell’s struggle against sleep to maintain his own individuality is, to be sure, a most important motif in the film. In disavowing the film’s laughably alarmist title, Siegel tells Braucourt, “I wanted to call it simply Sleep No More.” Think of a man unable to sleep—afraid to sleep—for fear that he will be robbed of his humanity, perhaps even his life, and you recall inevitably the vampire’s victim. But only in sleep, in dream, does the subconscious receive the full outlet necessary to keep the waking individual balanced, “sane,” and “civilized.” Deprivation of sleep could itself lead to manic paranoia; and, posting the validity of the film’s prologue and epilogue, the viewer could easily believe Dr. Bennell to be insane, or at least emotionally disturbed. His situation is an interesting reversal of the normal state of man, where sleep is a good, which sharpens the individual’s mind and body, and maintains his ability to function with freedom and self-control. Here, sleep is to be feared, for through it one loses these same abilities. In this sense, the body snatchers, which—like the subconscious—seize control while the conscious sleeps, are not far removed from the Id Monsters of Forbidden Planet. Another fear the film plays upon is equally grounded in childhood experience: the fear of doctors. Invasion of the Body Snatchers is filled with doctors. Dr. Miles Bennell is the hero, and the teller of the tale. The chief body snatcher is a Santa Mira psychiatrist of influential prominence. And it is the doctors at the hospital in the prologue and epilogue who mediate between Dr. Bennell and the theater audience. This use of doctors is firmly in the tradition of Gothic cinema, with its Dr. Caligari, Dr. Frankenstein, Dr. Jekyll, and Dr. Van Helsing. In fact, there is more than a suggestion of Frankenstein in the pool table scene. As Dr. Bennell realizes that the form before him is not a corpse, one recalls Frankenstein’s words, “That body is not dead; it has never lived!” And there is a touch of the mad doctor in Bennell when he eludes the body snatchers by giving them hefty shots of a sedative. This pervasive use of men of medicine is more than a convenient motif to match the film’s metaphor of body-replacement. It also calls into play the anti-Promethean motifs of previous fantasy cinema; and, by making the head body snatcher a psychiatrist, the film panders to the prevailing anti-intellectualism of the mid-Fifties. This “doctor of the mind” is one who willfully deprives minds of their passions, their quirks, their personalities. The hero, Dr. Bennell, is a “good doctor,” a healer. And that role, too, is played upon and amplified in the later sections of the film, where his behavior has begun to seem desperately paranoiac. He regards himself perhaps as a world-healer of messianic proportions, as he expresses his conviction that he is the only one left who can save us, that we are all doomed unless we listen to him. Considering the state of public opinion in the United States today, from the recent wave of McCarthyism to the fear of a third World War, it is natural to see the pods as standing for the idea of communism which gradually takes possession of a normal person, leaving him outwardly unchanged but transformed within. This is the kind of simple-minded presentation of the problem that can be found in Reader’s Digest, but it corresponds to the average American’s views as they have been shaped by television and a wide range of periodicals. The film’s use of sleep as the act of willful submission to the invaders may easily be viewed as a metaphoric reminder to the United States and its citizens to be always vigilant, always “awake,” against communist subversion. One recalls tangentially the television public service announcements of the late Fifties and early Sixties: “Sleep well tonight; your Air Force is awake.” The sleep motif also calls to mind the widely repeated jokes about McCarthy (in the Fifties) and J. Edgar Hoover (in the Sixties) sleeping with nightlights and searching under their beds for communists. Braucourt: Some critics have seen the film as a parable about the spread of fascism. Is that too farfetched an interpretation? Siegel: At the outset, neither the scriptwriter nor I had that in mind. What we wanted to attack was much more a general state of mind that is found in everyday life. As the director I found it much more exciting, instead of seeing the story as a fascist plot, to show how a very ordinary state of mind could start out in a very quiet small town and spread to a whole country. But it’s certainly possible to make the interpretation you mention, I’ve no objection to it at all. In any case, I think it arises quite naturally because the aim of fascism is that people under its rule should be like that, having no emotions or personality, like vegetables. Obviously there are political implications in Invasion of the Body Snatchers. All I was interested in, however, was the entertainment value in showing those implications. The fact that the world is peopled by pods was sufficient reason to make a picture like Invasion of the Body Snatchers, be it an attack on McCarthyism or an attack on communism. Johnson himself summarizes the safest view of the film by saying, “The fact that Invasion of the Body Snatchers could be interpreted as both McCarthyite and anti-Fascist suggests an ambivalence in its attitude toward conformity—revulsion tinged with fascination.” Such an ambivalence is certainly understandable in the Fifties, when in theory our enemies were accused of creating rigid conformity and regimentation our of free men, while in practice the same kind of conformity was richly rewarded in the context of the American socioeconomic work ethic. And so one may, with equal success, interpret the conformist body snatchers as either socialist bureaucrats or fascist militarists. But to claim that the film was leftist rather than rightist in intent is to naïvely ignore what is most evident about the social viewpoint of all of Siegel’s work–a uniformly conservative Americanism–and what is most obvious about the political tenor of Hollywood in the mid-Fifties, the effects of McCarthyism and blacklisting still sharply felt, and the Hollywood Ten working under pseudonyms, if at all. The preceding article is from Mr. Cumbow’s work-in-progress on the science fiction film. It has been slightly edited for publication here.